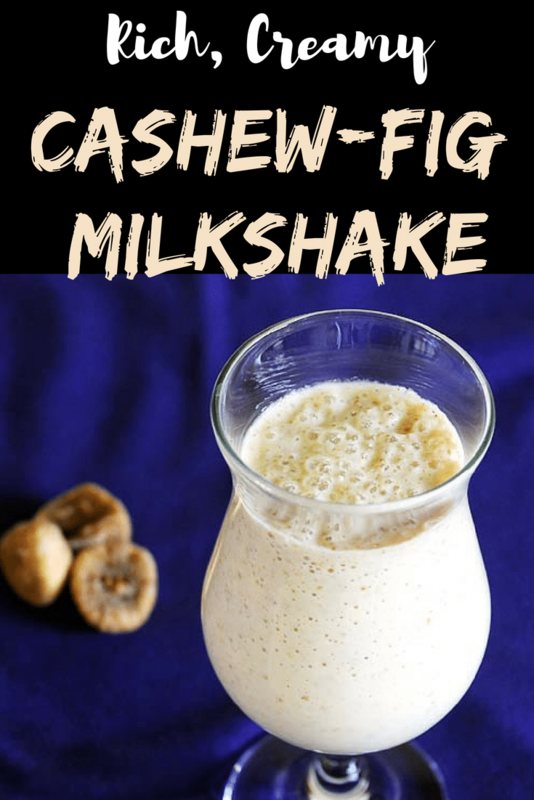 Cashew fig milkshake recipe (Kaju Anjeer Milkshake)- Milkshake made with milk, cashew nuts and dried figs. Kaju Anjeer milkshake is very healthy and nutritious milkshake for growing kids and for adults too (of course if it is made without ice cream). You might know that dried figs are richest in fiber, copper, manganese, magnesium, potassium, calcium, and vitamin K.
When I was in India, I always enjoyed eating dried fig ice cream. The crunch of the fig seeds while eating, I just love that feeling in the mouth. But here in USA, I do not get fig ice cream. 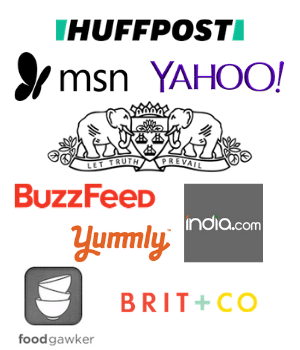 So I thought of making the kaju anjeer milkshake. I like dried figs because as I said earlier I like to bite those little crunchy seeds. It gives nice texture to the smooth and creamy milkshake. I have added cashews which gives nice nutty flavor to the milkshake. It is very important to soak the figs in water for about 4 hours. Because dried fig has tough skin and it won’t blend it that smoothly. So if we soak it then skin will become soft. and we are able to chop them. so milkshake will become nice and smooth. I was craving for rich milkshake, so I have added ice cream here. But of course you can skip it to make it healthy. 1) Take dried figs and cashew nuts in a small bowl. I have used broken cashews. Soak them in the water. Add enough water, so figs and cashews are just covered. Do not add too much water. 2) Let them soak for at least 4 hours, more hours will not harm. By that time, figs will absorb all the water and become very soft. 3) Now chop the figs into small pieces. 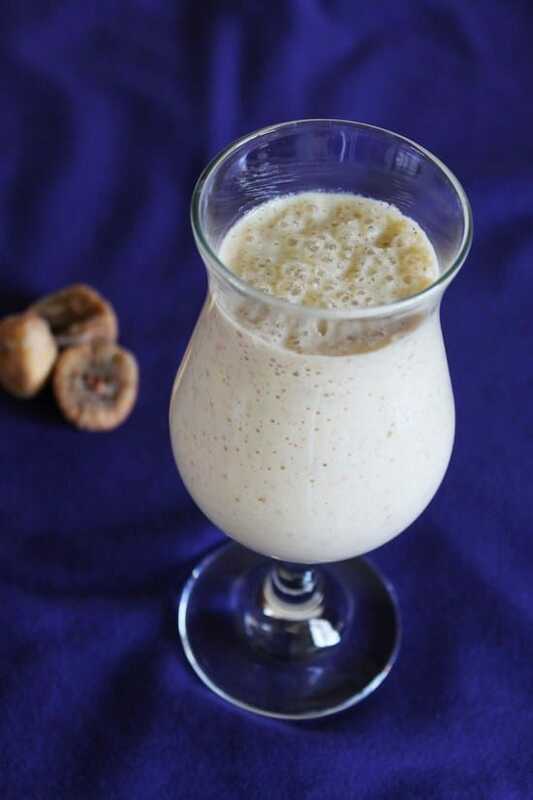 4) Take cashews and figs in the blender with milk, vanilla ice cream and sugar. 5) Blend it till figs and cashews are ground and smooth. 6) Pour into serving glass and serve. Serving suggestion: Enjoy this cashew fig milkshake in this hot summer weather. This is creamy, thick and delicious kaju anjeer milkshake recipe. Take dried figs and cashew nuts in a small bowl. Soak them in the water. Add enough water, so figs and cashews are just covered. By that time, figs will absorb all the water and become very soft. Now chop the figs into small pieces. 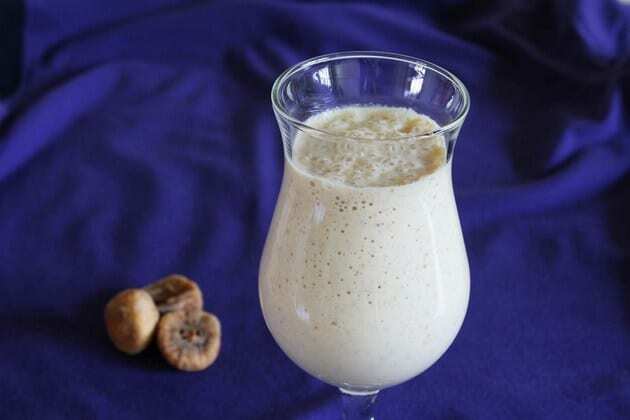 Take cashews and figs in the blender with milk, vanilla ice cream and sugar. Blend it till everything is well blended and smooth. Pour into serving glass and serve.